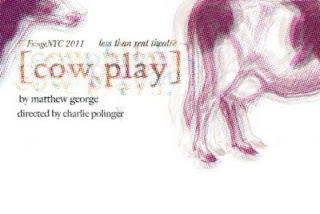 To say Cow Play is just a thought provoking piece of theater would be a tragic understatement. Less Than Rent, an ambitious and productive group of rising artists, have brought this enticing play to life in perfect Fringe fashion. Without giving too much away for fear of spoiling the plot, Cow Play centers around two brothers, Mark and Jed, one who’s able to break free from the constraints of home, the other who remains. Mark goes to college, falls in love with Julie, an actress, while Jed tends to the farm after the sudden death of their father. The play presents various themes including grief, what it means to succeed and the values of life and death. The piece is broken up into four parts. The first and fourth parts transcend time and place, bouncing from location to location, while the second and third part remain on the farm over the course of one summer. The middle two sections are by far the most interesting parts of the play forcing the first and last to serve more as a too lengthy prologue and an epilogue of exposition show and tell. As the play unfolds, Julie starts to scarcely emulate a person from Mark and Jed’s past, which affects them both in drastically different ways playing straight into the ideals of how to grieve the ghosts of the past. The production as a whole fit perfectly to the needs of the Fringe Festival. It never tried to be more than it was capable of. Yet, I continually wondered how this very cinematic script would play on screen, especially during the very static, surrealistic first and fourth parts. Cow Play would make a near perfect indie film. Matthew George’s script is chock full of potential. I would love to see what a more streamlined, intermissionless version of the script would be. While the believability of certain aspects of his characters seemed contrived, he created relationships that are far too familiar. Alex Kramer and Will Turner as the Willard siblings could not be more different as actors and characters. Kramer’s Mark was both charming and inviting compared to Turner’s Jed who took the entire play to finally break down the guard he fronted. Kramer seemed to stand out the most in the company, perhaps because his character seemed to be the least tragic and most connected. Willa Fitzgerald’s Julie grew on me as the play neared the end. She seemed to try too hard to please everyone and everything around her. From Jed to her unseen auditioners to Antigone the cow, Julie continually groveled for acceptance. Cow Play contained so many aspects of theatrical styles, from realism to abstract to surrealistic elements, that I was so intrigued by the occasional disconnect. Sometimes for better, sometimes not so much. Perhaps it was when and how the projections were used. The claymation cows were appealing to the eye but left little to the imagination. The conceit with projecting the various letters, documents, and other objects took away from the great work the actors were doing in front of the blank wall. Again, another instance of show and tell. In a film version, the camera would probably pan into the letter the character was reading. It just didn’t fair well in a theater setting. There was rarely a moment where there was not action on stage. Charlie Polinger’s staging was quite polished. He created a cohesive language of locale for the characters to play in. When we jumped time, there was never confusion. Dan Geggatt’s set served perfectly to suggest the world of the play allowing for the right amount of imagination to set in. Less is more in this instance. If you’re looking to see the next generation of theater artists, you must see Less Than Rent’s production. Expect big things from them in the future. They’re heading in the right direction.